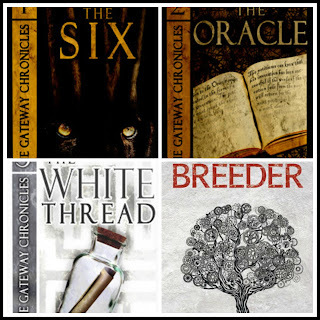 Week 2 of The Six Read Along and we are discussing chapters 2, 3 and 4. If you missed last week's discussion of the Prologue and Chapter 1, you can view it here. Author K. B. Hoyle shared some tidbits that you might not know so do read the comments. 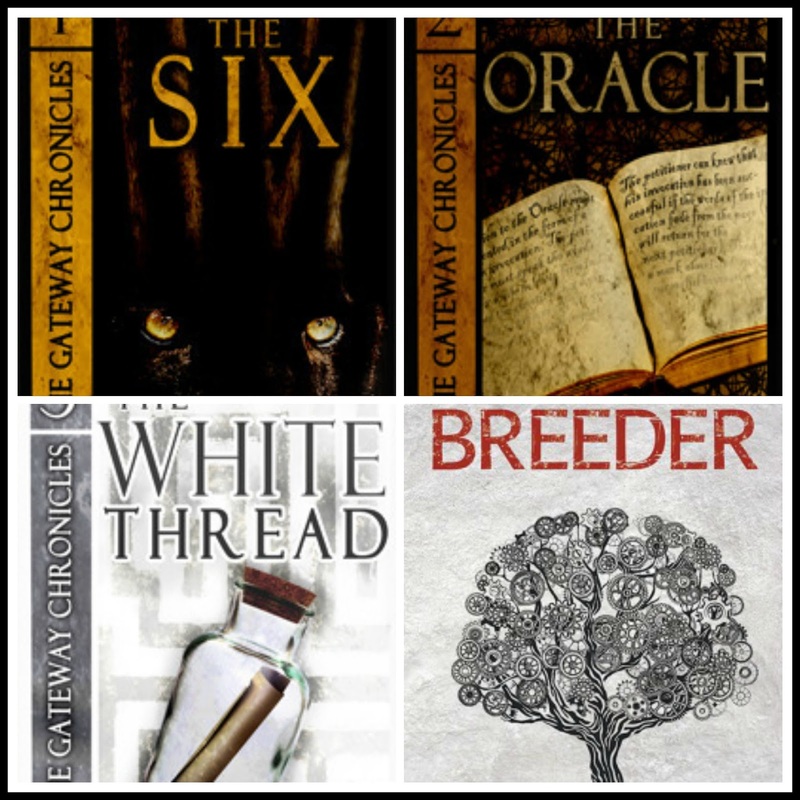 In addition to joining the discussions, K. B. Hoyle is also offering an international giveaway where one lucky person will win ebooks of The Six, The Oracle, The White Thread, AND book 1 of her new series Breeder. The rafflecopter is at the end. As I reminder, I'm reading an early edition The Six and there may be some differences and I would love to discuss those differences and their impact on the reading experience. Please feel free to leave comments with your thoughts. If you have questions ask them too! I really want this to be a discussion and not just me talking. If you haven't started the series yet, you can get a copy at Amazon. At the beginning of this chapter Darcy and her family are still in the car making their way to family camp at Cedar Cove. Darcy has relented some and agreed to play the alphabet game with Roger. What kind car games did you play when you were a kid? Funny, when I was Darcy's age meeting new people didn't induce panic. I loved going to camp. As an adult though it does bother me a bit when I think about going to a social function. Perhaps if Darcy didn't dislike Sam and Lewis so much she wouldn't be in such a panic. If you were in Darcy's shoes, would you be excited or anxious that in 30 minutes you would be arriving at Cedar Cove? What do you think of the first description of Cedar Cove? If you have read Hoyle's blog or read any interviews with her, you know that she used a family camp she attended as a teenager as the basis for the setting. Is he a possible love interest? And of course, Roger, ever the little brother, embarrasses her. I'm the youngest in my family so I didn't have to worry about this and with my sisters being several years older, I don't think I had an opportunity to cause them this embarrassment. What about you? Have a you been embarrassed by a younger sibling? What are your favorite moments from Chapter 2? Of course the first person Darcy runs into (literally) is Sam. At this point, I'm probably more identifying with Sam than Darcy. I was the overly exuberant "friend" at that age. Are/Were you more like Darcy or Sam? I think Darcy's dad has it right. I thought it strange that there were two bunk beds. Now, at a camp that only had kids I would understand the bunk beds, but with adults there you would think there would be a double bed at least. When I took a cruise with a large group, we stayed in a cabin that had a queen/full bed and 4 bunks. There was a curtain that could be pulled to separate the large bed from the bunks. I would think that is more what would be at family camp. But maybe it wasn't used as a family camp all the time. The description of the bathroom reminds me of my freshman college dorm. I think we may have had one more stall, sink, and shower, but after having a bathroom all to myself for a number of years it was an adjustment. Actually it was rare that all of the showers or stalls were in use so it wasn't much of a problem. And this time Darcy didn't need Darcy's help in embarrassing herself. Dropping the rolls would be something I would do. What was your first impression of Perry? Maybe it was my personal experience, but I wondered if this group was only friends at camp. I know Sam and Lewis go to school with Darcy, but I can't remember if the other three see each other during the year. But they are quite the diverse group and even in middle school cliches are forming. I get the impression of Perry and Amelia would be part of the popular crowd. From Darcy's description, Sam and Lewis are bit of outcasts or part of the "misfit" group. At this point we don't know enough about Dean, but maybe he's a loner. If you went to camp, did you have camp friends who you weren't necessarily as good of friends back home? What are your thoughts on chapter 3? Now if you have TWCS's edition of The Six this chapter is the prologue. I forgot to look at Mom's copy to see if her book still has chapter 4 as Skipping Rocks. What did you think about the "tingling" Darcy experiences? Did you think it was just something she imagined, or at this point you were already considering that there was something magical about Cedar Cove? I find it difficult to believe Darcy has never skipped rocks. If there was any pool of water and any rocks near by, as kids, we were always skipping rocks (truth be told probably even as an adult I would have the urge to skip rocks). Did you skip rocks as a kid? Were you any good at it? Chapter 4 brings us to the point where most readers decide to keep reading or give up. How do/did you feel about the book at this point? Was it must continue, I'll keep reading for a bit more at least, or (if this your first time read) give up? I would love to hear your thoughts so far on The Six, please leave a comment. What an amazing chance! Thanks so much. re: the skipping rocks thing... I guess I only skipped rocks when I was little when I was around larger bodies of water, and I was rarely around larger bodies of water, so it kind of became a camp thing. That's how I ended up writing it into the story, too.